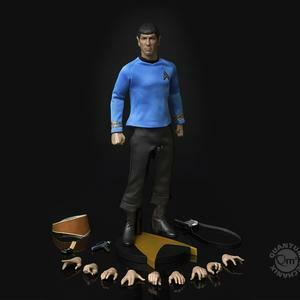 To celebrate the 50th anniversary of Star Trek™: The Original Series (TOS) this year, QMx is bringing everyone’s favorite Vulcan to Trek collectors everywhere with our Master Series articulated figure line! 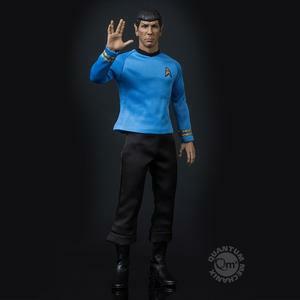 The half-Vulcan/half-Human Mr. Spock was the first officer of the starship Enterprise on her maiden voyage. This 1:6-scale figure re-creates this iconic character in exquisite 1:6 detail. Standing approximately 12 inches tall, every element, from his 23rd century tunic to his custom black boots, is authentically reproduced. The original portrait sculpt of Leonard Nimoy as Spock was personally approved by the actor’s estate. -Fully Articulated Body: More than 30 points of articulation allow the figure to be displayed in multiple dynamic poses, approximately 30 cm tall. - Realistic Portrait: Lovingly rendered by a top artist, this is a perfect likeness of Spock with realistic wrinkles and pointy ears. Each head sculpt is specially hand-painted. -Starfleet Duty Uniform Tunic: Meticulously researched, this duty uniform tunic matches the pattern, fabric and color of the original costume down to the last stitch. The sleeves are trimmed with accurate and detailed braid insignia. -Starfleet Standard Issue Black T-Shirt: This regulation black tee is worn under the tunic. -Starfleet Duty Uniform Pants: This faithful replica of the pants worn by the Enterprise crew in Star Trek™: TOS features the characteristic bell-shaped leg. Metal plates sewn into the pants allow the magnetic phaser and communicator to be worn without the belt. -Boots: Using leather-like material cut in the original style of the footwear worn in Star Trek™: TOS, these boots zip up on the inside. -Star Trek Delta Symbol Display Base: A custom display base featuring the familiar Star Trek delta symbol will hold up the figure and allow more extreme poses.